Keeping your feet in good shape and protecting your joints ensures you can continue with your workouts. Selecting the right shoe for the type of workout in which you're engaged is a critical part of your training preparation. 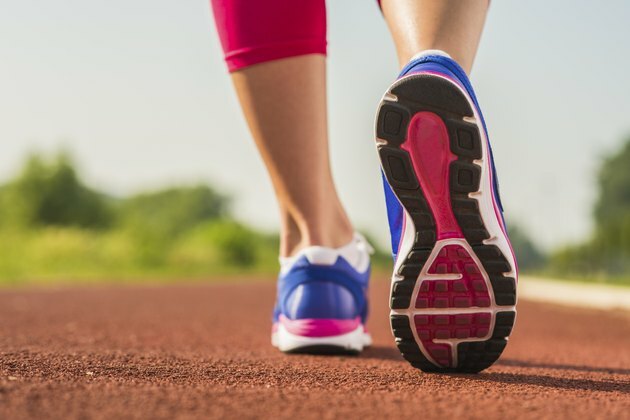 Two types of shoes, cross-trainers and running shoes, share some similarities, but their differences mean you must select the right shoe for your activity. Cross-trainers are designed to play multiple roles. You can use them in the gym for almost any activity — lifting weights, your yoga class, using the elliptical machine, stretching, basketball or a Zumba workout. Running shoes, on the other hand, are specifically designed for people who pound the pavement, the track or the trail. While cross-training shoes provide cushioning, running shoes go much further in protecting your feet from impact with the ground. Regular runners shouldn't use cross-country shoes. They simply don't provide enough cushioning and support, whether you are running outside or inside on a treadmill. Using a cross-trainer for running leaves you susceptible to foot, knee and back injuries. Running shoes, as you might guess, are lighter than cross-trainers. This lack of weight makes it easier to run, especially when you are piling up the miles. If you walk regularly, use a running shoe for that purpose as well. The heavier weight of the cross-trainer provides extra durability and control to support lateral movements. The sole of a cross-trainer is wide and stable, often expanding beyond the width of the upper port of the shoe. This width provides more support for lateral movement that you engage in with these shoes. Runners rarely make the sharp cuts and lateral movements that are standard on the basketball court or a dance class, for example. In addition, the tread on running shoes is smooth, which provides less traction, but because runners are essentially moving straight ahead, traction is rarely an issue. Runners in particular require shoes that can be fitted for the particular shape of their foot. Models of running shoes are designed for people who overpronate, rolling their feet inward when they stride, or underpronators who generally have flat feet. You don't want to run hundreds of miles in shoes that don't cradle your feet properly. Try any shoe on before buying, and, if you're running long distances, have an expert fit you to the right shoe after observing your movement.